Austria, Belgium, Czech Republic, Denmark, Estonia, Finland, Hungary, Ireland, Italy, Liechtenstein, Lithuania, Luxembourg, Netherlands, New Zealand, Norway, Poland, Portugal, Slovakia, Slovenia, Spain, Sweden and Switzerland. 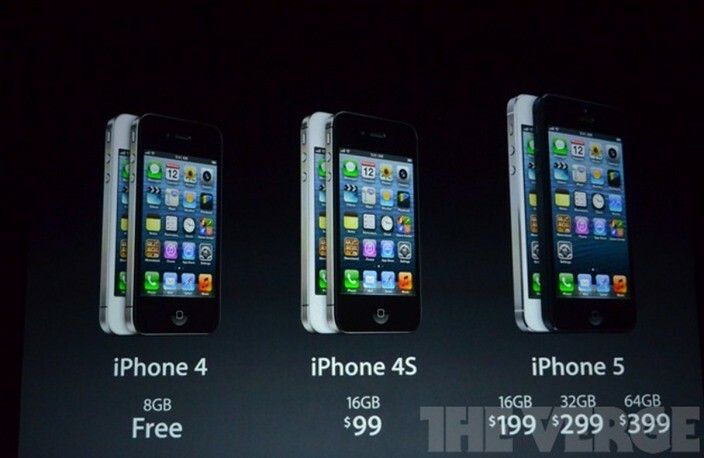 The 16GB iPhone 4S will remain available for $99. As for the 8GB iPhone 4, it will become free. SAN FRANCISCO—September 12, 2012—Apple® today announced iPhone® 5, the thinnest and lightest iPhone ever, completely redesigned to feature a stunning new 4-inch Retina™ display; an Apple-designed A6 chip for blazing fast performance; and ultrafast wireless technology*—all while delivering even better battery life. ** iPhone 5 comes with iOS 6, the world’s most advanced mobile operating system with over 200 new features including: the all new Maps app with Apple-designed cartography and turn-by-turn navigation; Facebook integration; Passbook® organization; and even more Siri® features and languages. iPhone 5 is the thinnest smartphone in the world, with an all-new 7.6 mm anodized aluminum body that is 18 percent thinner and 20 percent lighter than iPhone 4S. Designed with an unprecedented level of precision, iPhone 5 combines an anodized aluminum body with diamond cut chamfered edges and glass inlays for a truly incredible fit and finish. The new 4-inch Retina display on iPhone 5 delivers even more pixels than iPhone 4S, making the already incredible Retina display even better. By making the screen taller, not wider, iPhone 5 is just as easy to use with one hand so you can tap, type and scroll the same way you always have, while enjoying even more of your content including amazing apps optimized for the larger Retina display, widescreen HD video, a full five days of your Calendar and more of every web page. The all-new A6 chip was designed by Apple to maximize performance and power efficiency to support all the incredible new features in iPhone 5, including the stunning new 4-inch Retina display—all while delivering even better battery life. With up to twice the CPU and graphics performance, almost everything you do on iPhone 5 is blazing fast for launching apps, loading web pages and downloading email attachments. The 8 megapixel iSight® camera is the most popular camera in the world and with iPhone 5, it’s even better. The new camera is completely redesigned with incredible optical performance, yet amazingly it’s 25 percent smaller than the camera in iPhone 4S. The new iSight camera in iPhone 5 features a sapphire crystal lens cover that is thinner and more durable than standard glass with the ability to provide crystal clear images. The new panorama feature lets you capture jaw-dropping panorama images of up to 28 megapixels by simply moving the camera across a scene in one smooth motion. New video features include improved stabilization, video face detection for up to 10 faces and the ability to take still photos as you record. A new FaceTime® HD front facing camera makes FaceTime calls incredibly clear and can also be used for self portraits and recording 720p HD video. iPhone 5 also allows you to share photos with friends and family using iCloud’s Shared Photo Streams. iPhone 5 introduces new enhanced audio features including a new beam-forming, directional microphone system for higher quality sound, while background noise fades away with new noise canceling technology. iPhone 5 now includes support for cellular wideband audio for crisper word clarity and more natural sounding speech. Wideband audio will be supported by over 20 carriers worldwide at launch. iPhone 5 comes with the new Apple EarPods™ featuring a breakthrough design for a more natural fit and increased durability, and an incredible acoustic quality typically reserved for higher-end earphones. iPhone 5 comes with iOS 6, the world’s most advanced mobile operating system with over 200 new user features including: an all new Maps app with Apple-designed cartography, turn-by-turn navigation and an amazing new Flyover™ view; Facebook integration for Contacts and Calendar, with the ability to post directly from Notification Center; Passbook, the simplest way to get all your passes in one place; new Siri features, including support for more languages, easy access to sports scores, restaurant recommendations and movie listings;***** Siri and Facebook-enabled apps like Photos, Safari® and Maps; and Shared Photo Streams via iCloud®. iPhone 5 comes in either white & silver or black & slate, and will be available in the US for a suggested retail price of $199 (US) for the 16GB model and $299 (US) for the 32GB model and $399 (US) for the 64GB model. iPhone 5 will be available from the Apple Online Store (www.apple.com), Apple’s retail stores, and through AT&T, Sprint, Verizon Wireless and select Apple Authorized Resellers. iPhone 5 will be available in the US, Australia, Canada, France, Germany, Hong Kong, Japan, Singapore and the UK on Friday, September 21, and customers can pre-order their iPhone 5 beginning Friday, September 14. iPhone 4S will also be available for just $99 (US) and iPhone 4 will be available for free with a two-year contract. ****** iOS 6 software will be available on Wednesday, September 19 as a free software update. iPhone 5 will roll out worldwide to 22 more countries on September 28, including Austria, Belgium, Czech Republic, Denmark, Estonia, Finland, Hungary, Ireland, Italy, Liechtenstein, Lithuania, Luxembourg, Netherlands, New Zealand, Norway, Poland, Portugal, Slovakia, Slovenia, Spain, Sweden and Switzerland. * LTE is available through select carriers. Network speeds are dependent on carrier networks, check with your carrier for details. ** Battery life depends on device settings, usage and other factors. Actual results vary. *** Based on theoretical speeds, actual speeds may vary. ***** Not all features are supported in all countries. ****** Availability varies by carrier. You can follow Limerain on Twitter, Facebook, or RSS to be notified of any updates.